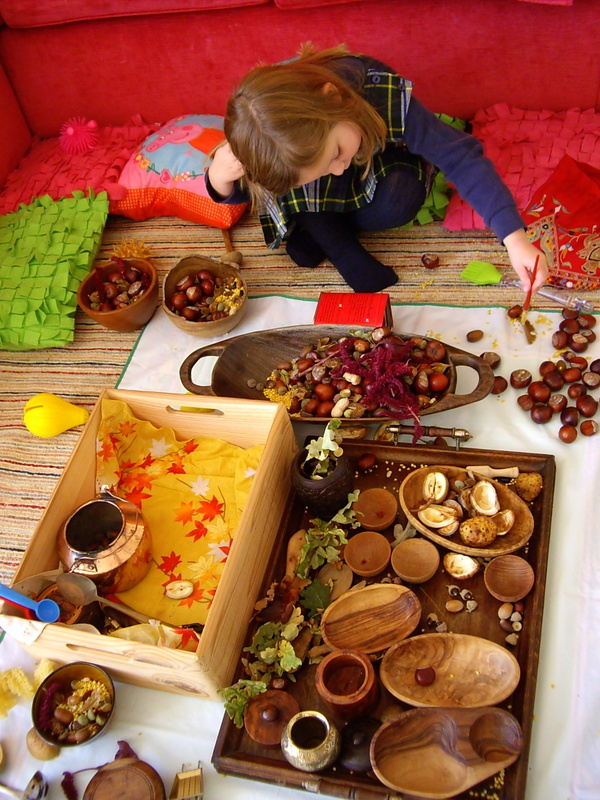 This is a lovely Box for bringing out at Autumn time, when it can be added to and used to explore topics such as seasonal changes, hibernation, animals and their diet etc. Autumn is a beautiful time of year, with maximum opportunity to experience the changing colours and textures of the leaves and all the interesting things that fall off the trees. 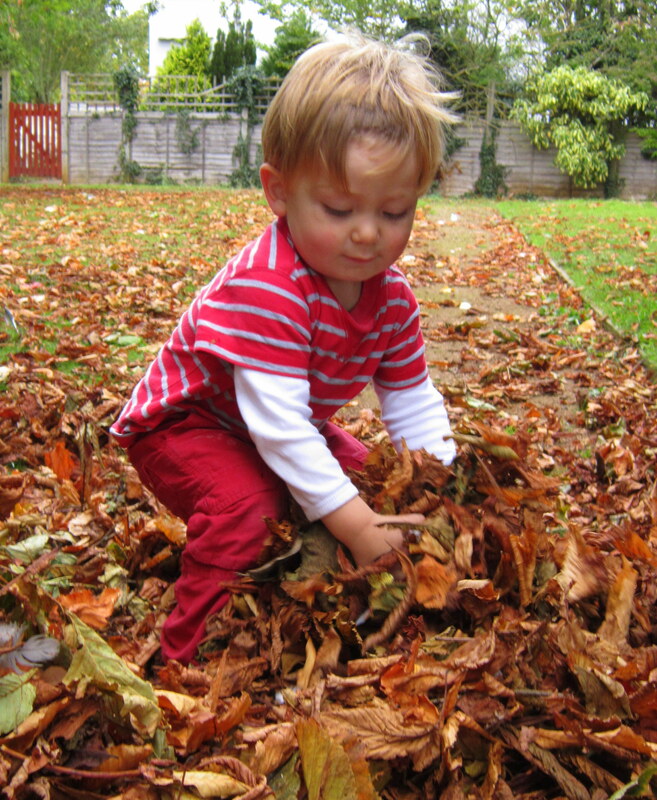 Wading through piles of Autumn leaves and throwing ‘leafstorms’ over each other is a MUST! 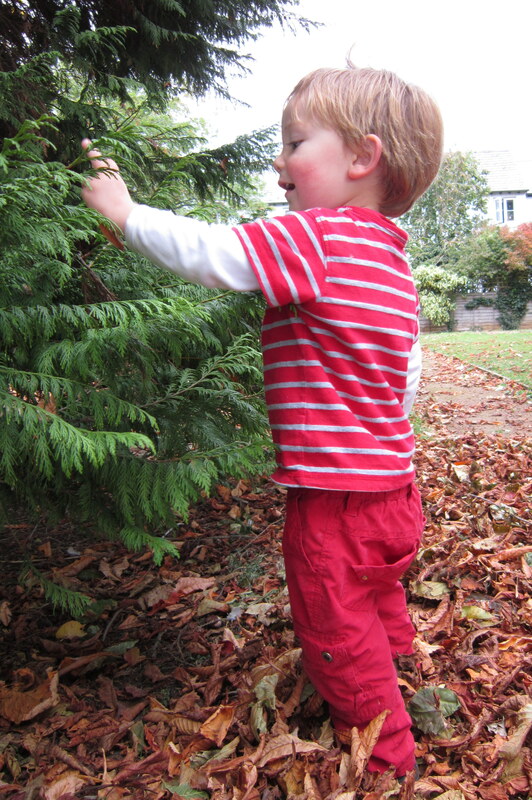 I have been talking to the little one about each season as it comes since he was about 20 months old, and at almost three, he now has a good grasp of what to expect and what is associated with each season, and will comment on the leaves falling down and the autumn colours. 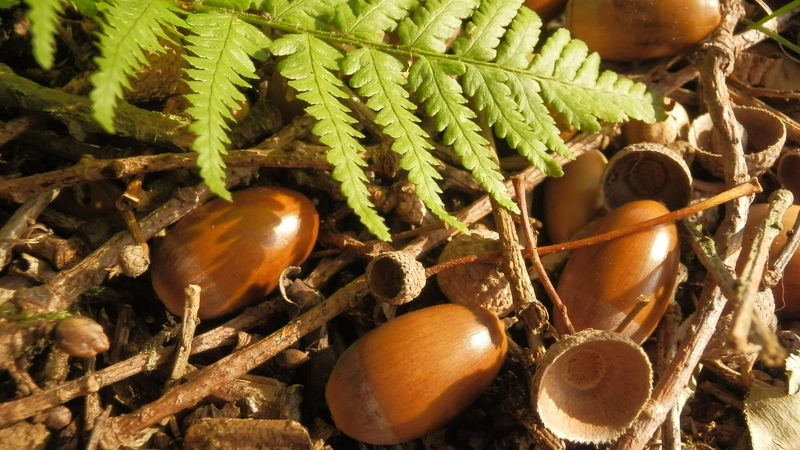 We spend hours collecting Autumn nuts and leaves from under trees (a great activity in itself), including conkers, hazelnuts, beechnuts and acorns, and we add brazils and almonds from the shops. If the hoover is feeling brave, I add various other types of ‘seed’ such as lentils, split peas, grains, beans, flax and sunflower seeds. Suitably diverted from my ‘adult’ agenda, I then decided life was too short, so we now keep everything poured into the big box with all the little bowls and boxes chucked on top! 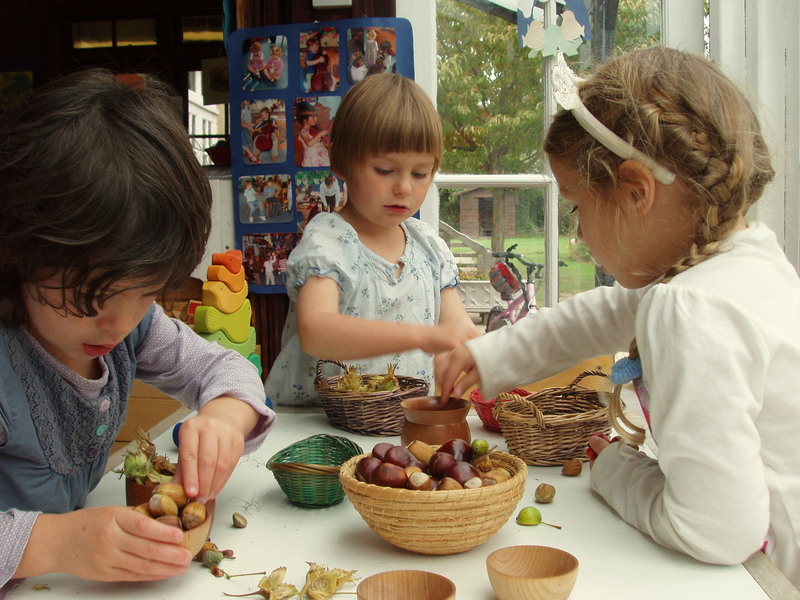 The children are then free to sort the all the different nuts into categories if they wish, or do whatever else they like with them! 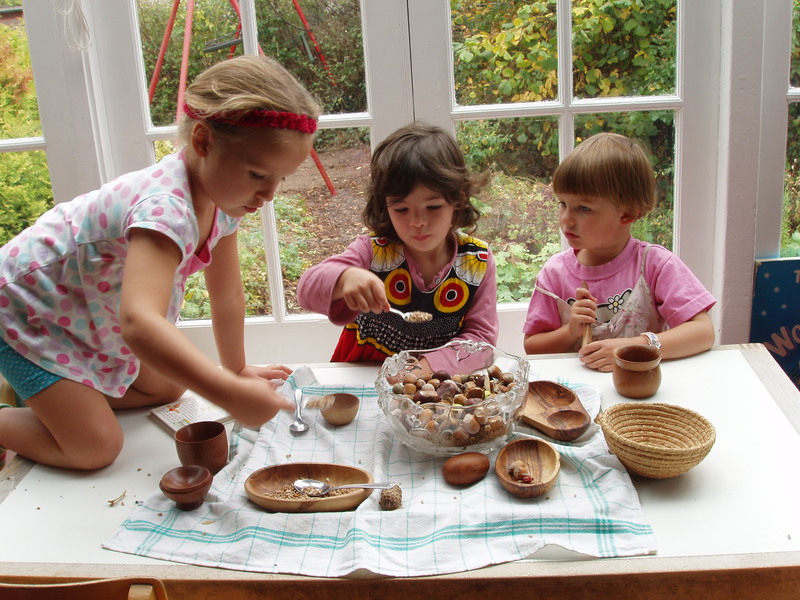 The number one hands-down favourite activity is always making ‘recipes’ with the nuts…. 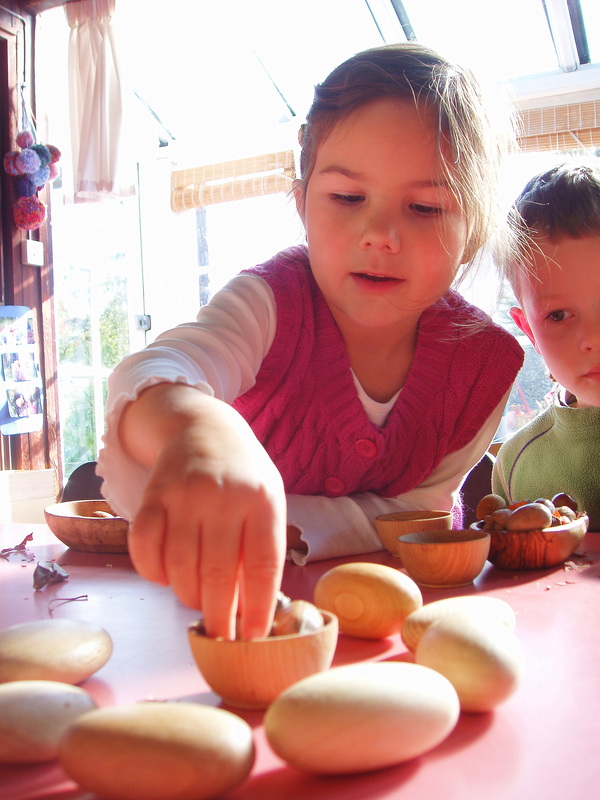 Nuts can also help teach children how to sort into categories, count, add and subtract or inspire imagination and wonder. 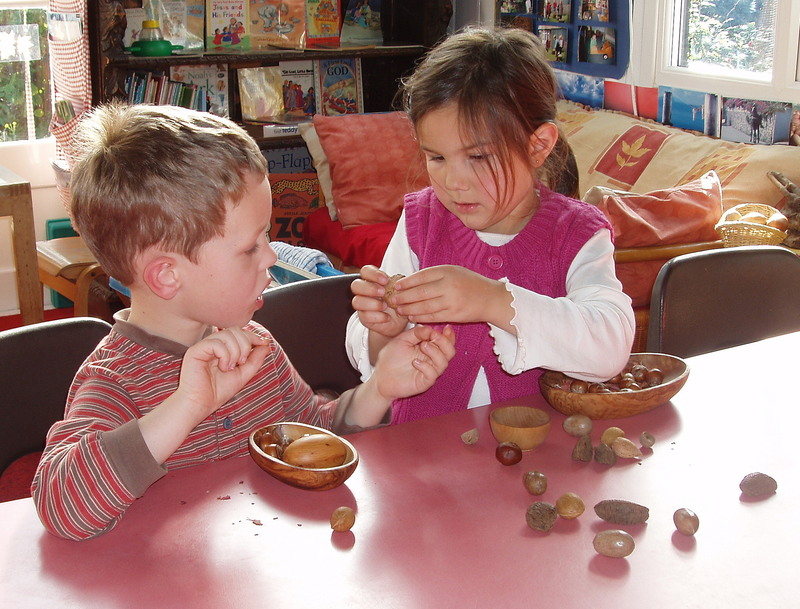 Simply exploring and arranging them freely is also deeply satisfying for young children. 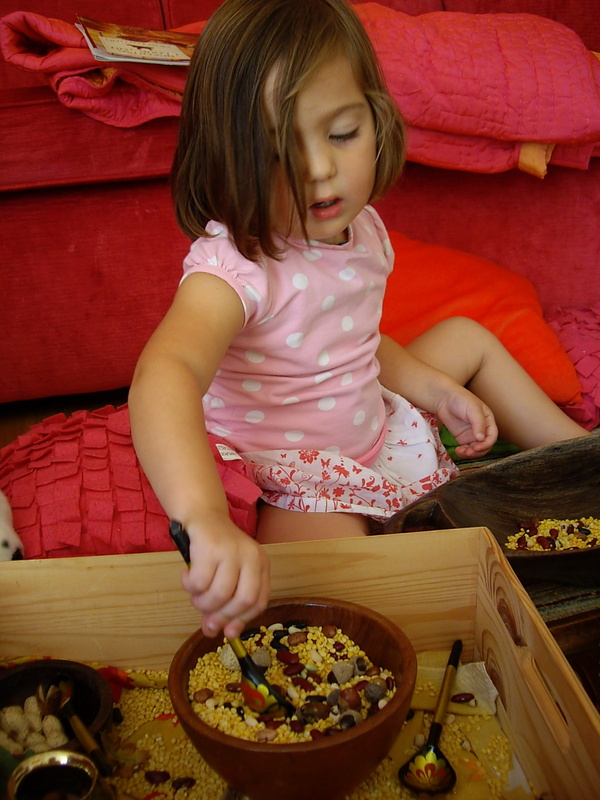 Lots of different big and little wooden bowls and some rustic spoons are an essential part of this Box. 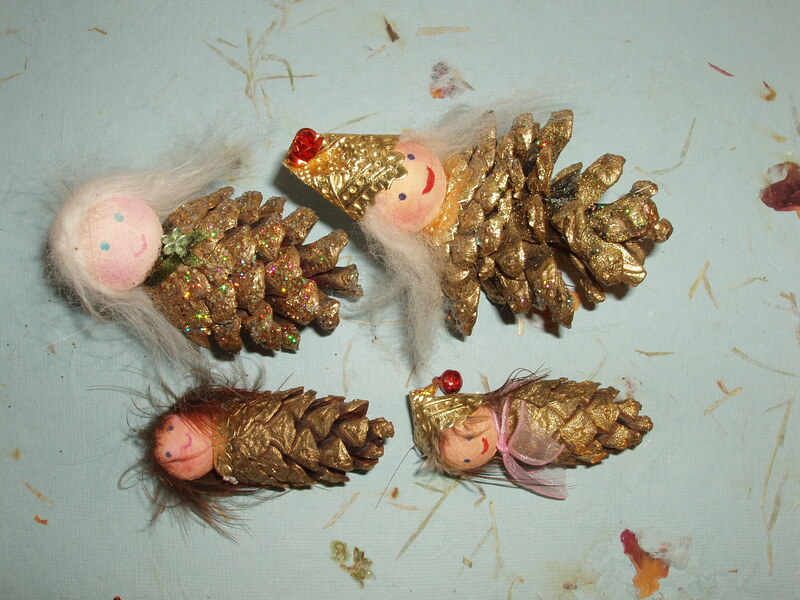 Another use for the cones in the box is making pine cone ‘angels’ at Christmas, with the help of lots of gold paint and glitter. We used little paper balls for the heads. The hair is made of feathers and bits of cat fur (from matted clumps trimmed off my Persian!) and sheeps wool. One enterprising little girl decided to trim some of her own hair, to make a pine cone replica of herself! 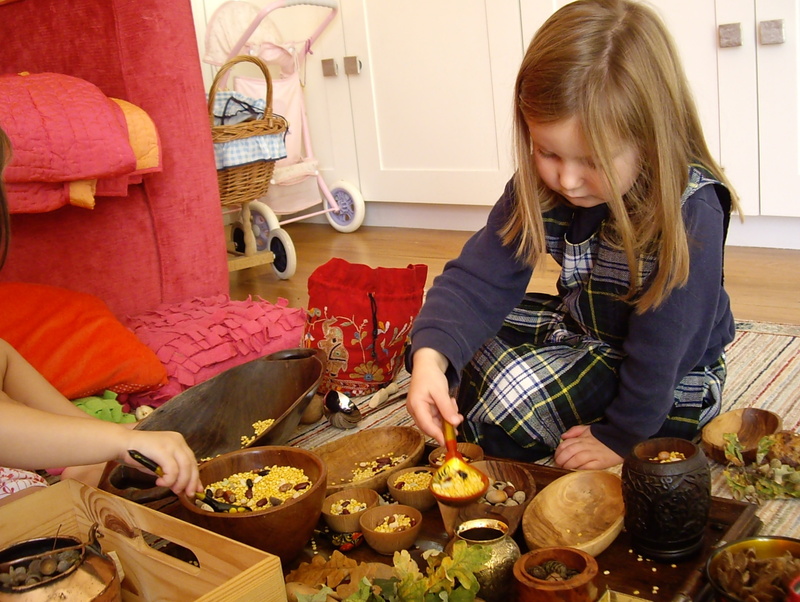 Please take a look at my post entitled ‘Natural Play’ for more ideas. 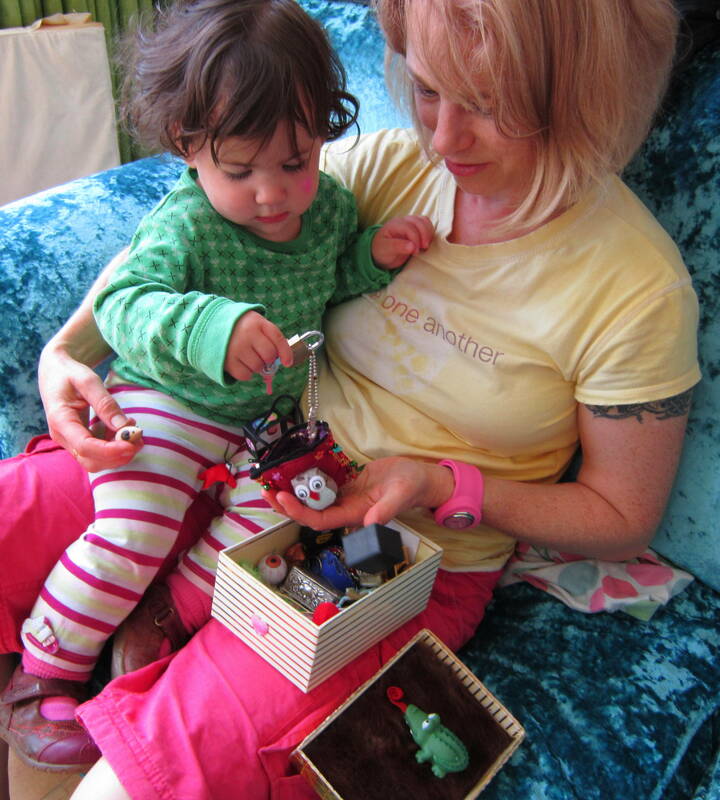 I have always supervised closely with all my Boxes.